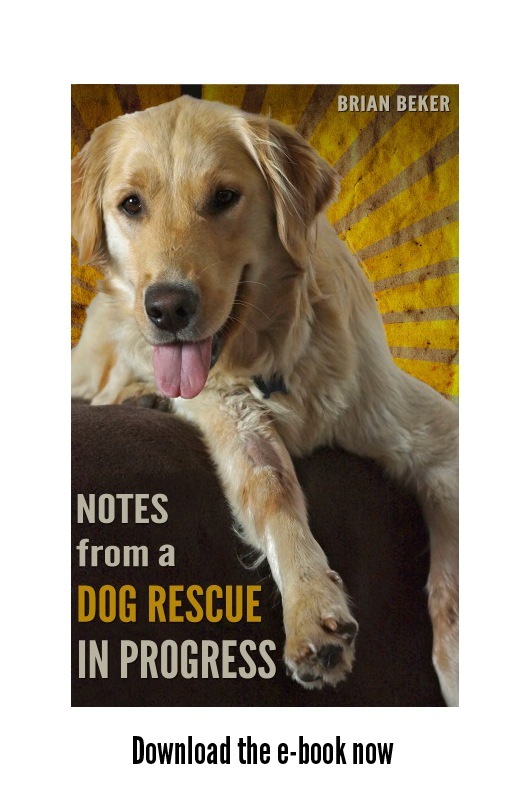 The ongoing story of Roo, the Golden Retriever puppy in the series Notes from a Rescue in Progress, and updates about The Dog in the Clouds, and Brian Beker's author blog. I wonder if Roo ever thinks about what an odd life she's led since she met me. She’s a happy dog - she prances and laughs and plays jokes on me and runs like a smoking cannonball - but there’s no doubt that all the traveling of the past year and a half has been trying for her sometimes. The next month or so might be the roughest. I don’t see any alternative to driving from North Carolina to California. And then back. All my stuff is in storage there, and if we’re going to move here, it has to be done, and the sooner I get it over with, the better. If Roo’s List was up and running, there might have been the possibility of someone Roo could have stayed with (please don’t offer to take her in - the point of Roo’s List is to be able to take the time to arrange that with confidence) so that I could have flown to Los Angeles. But it could take two weeks to take care of things out there. The alternative would be boarding, and I’m just not going to stick her in a kennel. Roo is in many ways too fragile. She’s definitely way too skittish for a crate manhandled into the belly of a roaring jet. She would be terrified. I just wouldn’t do it to her. So, I don’t see that there’s a choice. 2300 miles each way. The idea of being out there and having to face the drive back here is daunting. Before Roo there was Orville. He traveled all over the world. He was born in Colorado and spent his early puppyhood there. When he was nine months old I stuffed him in his crate and took him via San Francisco and Singapore to Kathmandu, the city over which he had appeared in the Himalayan clouds two years before. We spent six months in Nepal. Later, he traveled all over Europe a few times and across the United States numerous times, in various cars or in airplanes I flew. When he was small enough, he sat in the copilot’s seat. I taught him some basic piloting skills. He could keep the wings level by the time he was four months old. Later he had to sit in back. On the airlines, Orville was nearly killed three times in baggage compartments. After the third time, on a Lufthansa flight from New York to Munich on which the heater in the cargo hold was broken and it was only detected after I hassled a flight attendant so much to verify with the captain that everything checked out prior to takeoff that she threatened to have me removed from the airplane as an unruly passenger - which was fine with me, I assured her, as I was planning on becoming unruly if they didn’t confirm prior to departure that everything was all right, which it wasn’t - he became a service dog and flew in the cabin with me. Orville loved traveling. When I look at film of him in Nepal, he is a happy young dog. Later, I came to believe that traveling educated a dog and gave him confidence. Roo loves some parts of traveling, but not others. She still worries a bit in new motel rooms. She hides. She won’t come up on the bed or gnaw on a bone. On the other hand, she gets a huge amount of pleasure out of exploring new places to hike. City walks also thrill her, though sometimes it gets to be too much for her and she wants to get inside at sundown. But her general confidence is stronger all the time - just not to the point where I would risk all the progress she’s made to a trip in cargo or a few weeks behind chain link. Anyway. The incessant traveling has exhausted me to a pulp. The whole time since Roo and I teamed up has been spent looking for a place to live, much of the time while ill (thankfully that seems to have abated now). The amount of work I’ve failed to do makes me want to shoot myself. This drifting has to stop. If that ironically means one more road trip - the most maniacal of them all - well, then, so be it. It’ll be tough on Roo because I plan to barrel through with as many hours on the road and as few stops as possible - and the unpleasantness of Los Angeles on the other end. I comfort myself by imagining that it would be okay with her if she knew that when it was all over she might have her own place. Or maybe she would just remind me that she’s heard it all before. That was how the first part of the story ended - and then didn't. Frequent updates about Roo, the brave puppy in Notes from a Dog Rescue in Progress, and info about The Dog in the Clouds. Brian Beker's dog blog and author web site. Three years in the top ten of all dog categories on Amazon and a #1 best seller. Click on the picture to order from Amazon. Available in paperback or ebook. Audiobook coming soon. If you think a Rolls Royce would be a more appropriate ride for Roo, here's your chance to do something about it. Roo and I get into a terrible fight. The worst we ever had. I won. This photo is titled "Thank God for barbed wire"
I found another deer. This is a story of cruelty, so you may not want to read this any more than I wanted to write it. The Historic Roo Video Collection - Roo's first time at a dog park. Also a squirrel update. At Your Home for Yellow Journalism, if it bleeds, it leads. In which I rub salt in Roo's latest wound. Literally rub salt. Roo committed what might be her greatest act of perfidy yet. Multiple choice: Which photo doesn't belong? Roo crosses the bridge, just because. How do those tail hairs know when to stop growing? How about that Patreon campaign? Negative test results. But now what? You know that whole "Road Less Traveled" thing? Happy Birthday, Martin Luther King, Jr.
Petco? PETCO?! I don't need no stinking Petco! The shot that could have made me a millionaire - and it's out of focus! BREAKING: Roo makes two front pages in one paper in one day, still not satisfied. Where's Isis when you need them? Look – up in the sky! Is it a bird?! Is it a plane?! It's... The Duck in the Clouds! Snakes, thunder, needles in the gut, a lonely dog and 90 degrees. It's my blog and I'll complain if I want to. Is this Golden Retriever doomed? Fleas and snakes and ticks, Oh, my. Roo: Freezing, neglected "Outside Dog"
Where does Roo get her crystal meth? If Looks Could Kill. ..
Quick! In the water before it boils! Roo wants to know: Which one is it legal to kill? Yay! We get a second Fourth! Thank you for my pool, Daddy. Not that you're invited in. How about a moment of silence every day for PETA's dead? Top 'o' the world, Ma! Really? I had to introduce Roo to ice cream? Wishing you were here in sunny Cabo! Let's throw some money to the dogs! Would you buy a used car from this dog? Advice to Writers? OK - but from me? I'll post books here that I love. One of the most beautiful, but wrenching stories of courage and cruelty and what integrity means. 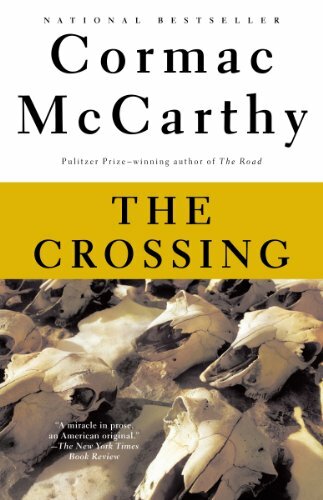 Stunningly written by a great master, The Crossing. 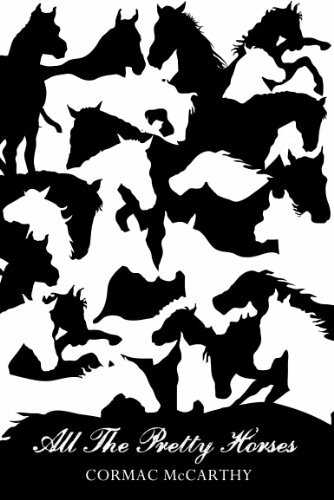 All the Pretty Horses is the book preceding The Crossing in the trilogy. If you're going to read all of them, start with All the Pretty Horses. If you might not, read The Crossing. All the Pretty Horses is a magnificent story (made into one of the worst, most botched, poorly directed movies ever committed to celluloid, so don't let that stop you) of young courage, integrity and learning how the world really works. It is a top-flight masterpiece. Your life can not be complete without reading these two books. An inventive, funny, romantic, well-written page turner about a 1920s magician. 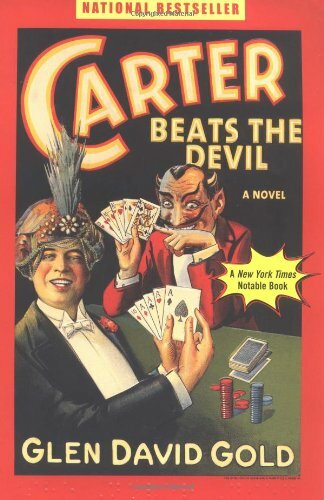 His love and respect for animals is central to the wonderful story of how Carter Beats the Devil. 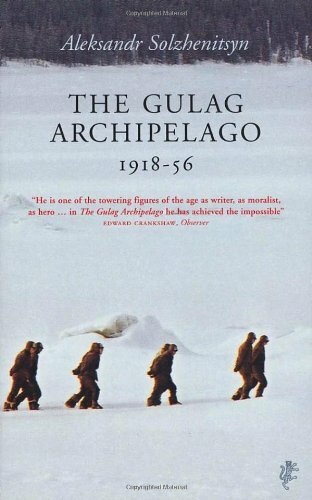 Perhaps the greatest work of literature of all time, The Gulag Archipelago is a lengthy, detailed history in which the extent of human cruelty and absurdity is painstakingly recounted. As difficult as it is, this should be read by everyone in the world. 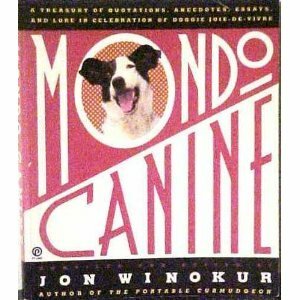 I loved Mondo Canine so much that it was the only book that, as many others came and went, remained on the coffee table in my hangar for over ten years. I never got tired of this compendium of dog stories, excerpts, quotes and images. One day, I met the author, Jon Winokur, and we've been friends ever since. Not a plug - I love this book, and every dog lover will, too. 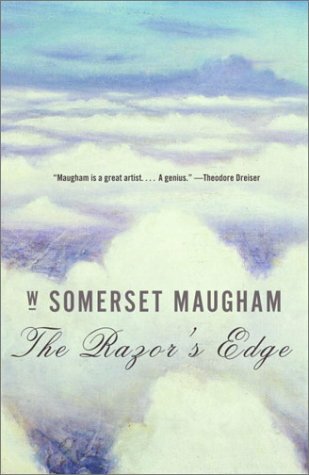 W. Somerset Maugham's story of a young man who finds his way to a simple life in complicated times had a large effect on my whole life. If you haven't read The Razor's Edge, you're in for a treat. Alan Furst has a magical talent for recreating Europe in the days before and into World War Two. This is probably my favorite of his books, as the story of a young NKVD agent who long journey though war and the violent and clandestine life of a Soviet spy, is close to my heart. 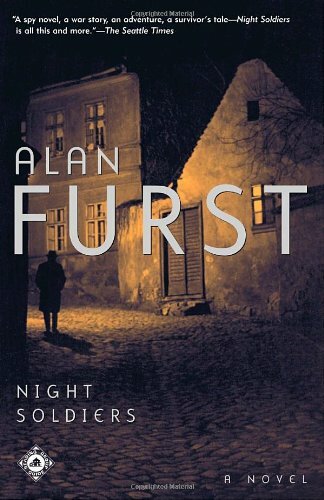 A rich and absorbing novel that places you everywhere from Bulgaria to Moscow to the Spanish Civil War, then Paris and New York in the 30s and 40s: Night Soldiers. 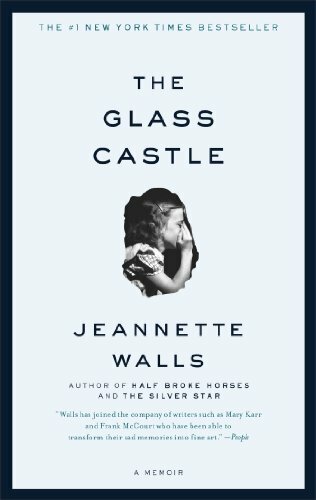 Reading this The Glass Castle made me consider giving up writing. The word 'masterpiece' may appear often in these blurbs, but it's because I'm putting favorite books up here. Robert Littell wrote intelligent espionage potboilers. In his 70s, he wrote a novel based on the life of a Russian Poet. This book is brilliant. 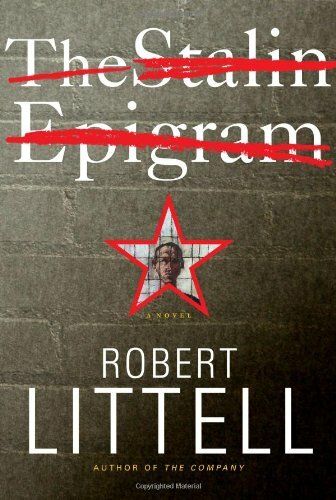 In a heart-wrenching historical novel, Littell evokes the Stalin-era Moscow intellectual scene, the terror of the Communist gulag, the injustice, the absurdity. The writing and story are superb. Read this book.